In line with the rumblings we have heard over the past couple of years from SEC representatives at various XBRL conferences and events, the SEC has recently announced three new initiatives that will expand and improve its Division of Enforcement. The official announcement does not expressly mention XBRL, but it is plainly evident that the advent of this data has given the SEC new abilities to analyze filings and to identify inaccurate or fraudulent financial statements. The SEC is touting these initiatives—the Financial Reporting and Audit Task, the Microcap Fraud Task Force, and the Center for Risk and Quantitative Analytics—as signaling their “increasingly proactive approach to identifying fraud” and improving their ability to “bring more cases aimed at deterring these types of unlawful activity.” RDG Filings has long been convinced that while the primary purpose of XBRL is for use by analysts at the end of the line, XBRL will also provide the SEC with an unprecedented tool in its enforcement efforts. The SEC says that these new initiatives will make particular use of “analytical techniques and computing capacity with special expertise in data mining.” You can read more about these new initiatives in this article from Compliance Week. RDG Filings is convinced that while companies participating in fraudulent behavior have new reason to fear the SEC, the real takeaway for all public companies is that with the SEC utilizing XBRL more aggressively to find reporting irregularities, it is all the more important to have your financials accurately prepared by XBRL and compliance experts. 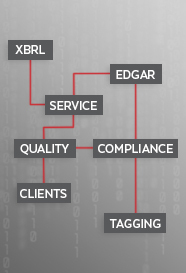 Nobody creates better XBRL than RDG Filings, and no do-it-yourself software can provide your company and your Officers the peace-of-mind they need now that the SEC is using XBRL data in their policing efforts. Contact RDG if you would like more information about our full-service XBRL filing and our XBRL Quality Assurance services.